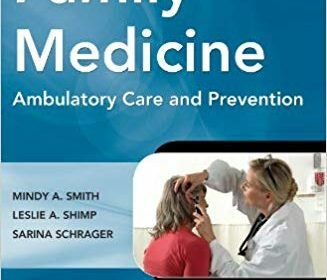 Formerly authored by Dr. Mark Mengel, Family Medicine: Ambulatory Care and Prevention delivers information on the most common complaints, problems, conditions, and diseases encountered by family medicine clinicians and other primary care providers who practice in an ambulatory setting. Evidence-based information and algorithms on diagnosis and treatment, including strength of recommendation ratings, is presented in a way that busy clinicians can access and implement immediately. Practical, specific treatment information, including medication dosing, side effects, and important drug interactions is included. Unlike similar texts which are organized by organ system, this manual is structured according to typical patient presentations in primary care settings of common symptoms and signs, follow-up needs for chronic physical or mental illness, and reproductive health concerns. In addition, the book provides information on screening and preventative healthcare recommendations. In all chapters, authors have integrated principles of clinical decision, evidence-based medicine, and cost-effective clinical management.